The Hero is a powerful addition to any great Jarl’s force in the lands of Viking: War of Clans. Yet, without the buildings the Hero needs to develop and hone their skills, they are just another soldier in your great army. This guide will focus on three vital buildings that help to increase the Hero’s might and give them an undeniable advantage on the battlefield. 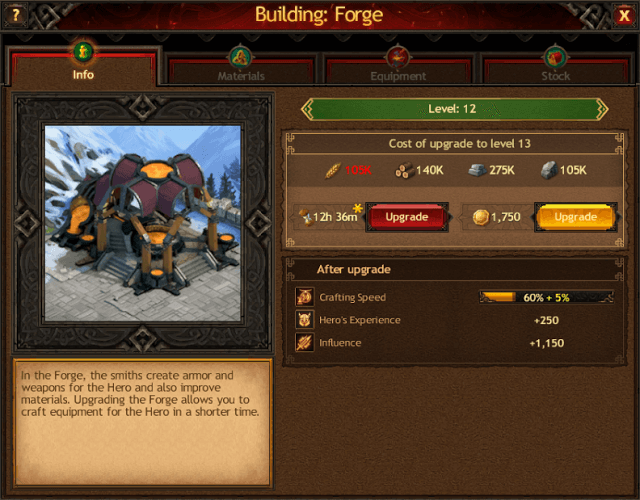 The Forge stores all the materials that the Hero gains fighting Invaders, attacking locations on the Global Map and completing other in-game tasks. These valuable trophies that you can use to craft the Hero’s equipment are in the Materials tab. By combining materials, you improve their quality and get the chance to provide the leader of your troops with armor and weapons that grant valuable bonuses and advantages. As you can see from the screenshot above, there are various types of materials: Simple, Usual, Unusual, Rare, Epic and Legendary. Each material type has its own color and determines how valuable the bonuses of the crafted equipment will be. To get a material of a higher quality, you need four materials of the same type. For example, to get one usual Lead, you need to combine four simple Leads. Note that combining is instant, so you need to be sure of your decision to get a specific type of material when you click the “Combine” button. 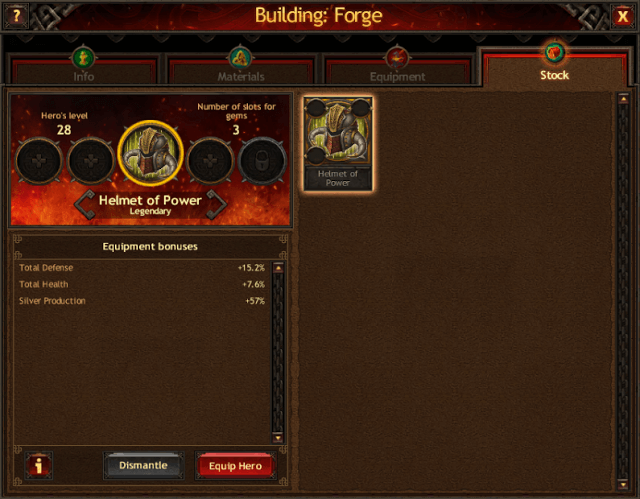 The equipment you can craft now or in the future is displayed in the Equipment tab of the Forge. Each piece of equipment has a set of specific bonuses. This may be construction speed-up, increased resource production, improved troop battle characteristics and much more. 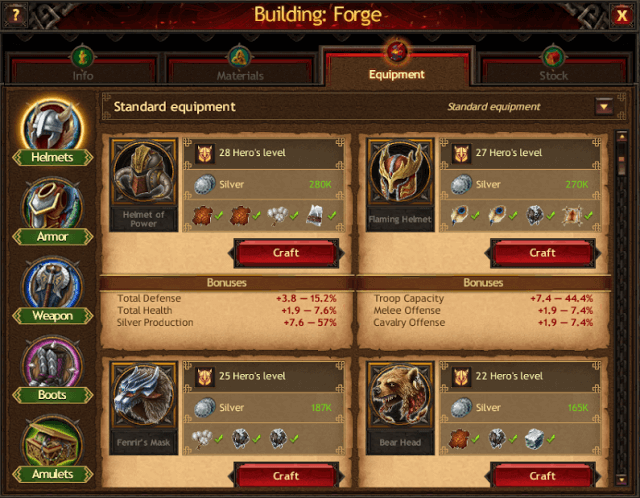 This means that you can craft various pieces of equipment for your Hero depending on the tactics you choose. Crafted equipment goes to the Stock tab. If all the conditions are met, your Hero can put on the equipment and go conquer the North armed to the teeth. 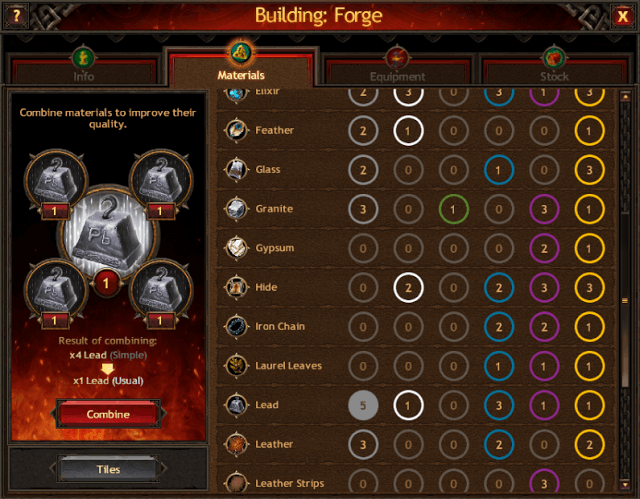 The Forge has 31 levels and each new level upgrade requires more time and resources. The Hero’s Abode is the home of the Hero and the place where you can find all necessary information about them. By upgrading the Hero’s Abode, you will increase the amount of experience your Hero gains, and level 21, 26 and 31 of the Hero’s Abode grant the Hero additional Skill Points. 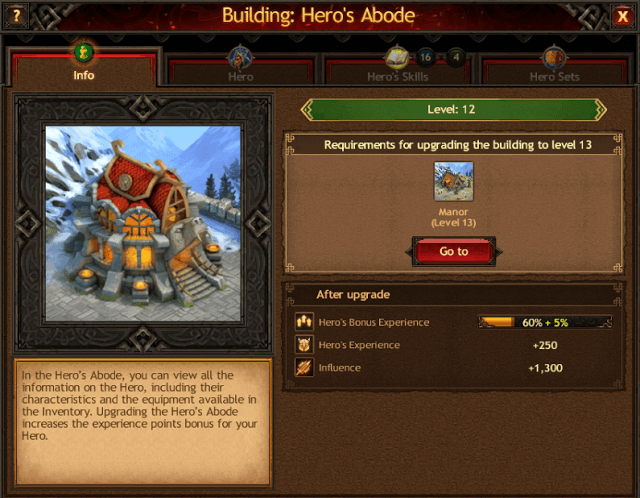 As well as the Information tab, where general information about the building is displayed, there are also the Hero, Hero’s Skills and Hero Sets tabs. Here you can find out which stats of your Town are increased thanks to the Hero, change their name and appearance, see the list of all existing Hero’s Skills and manage Hero Sets. In the War Bloc, Onslaughts are formed — joint attacks on other Jarls and the Place of Power that are organized by members of the same Clan. By joining forces with your allies, you can crush enemies in one fell swoop. 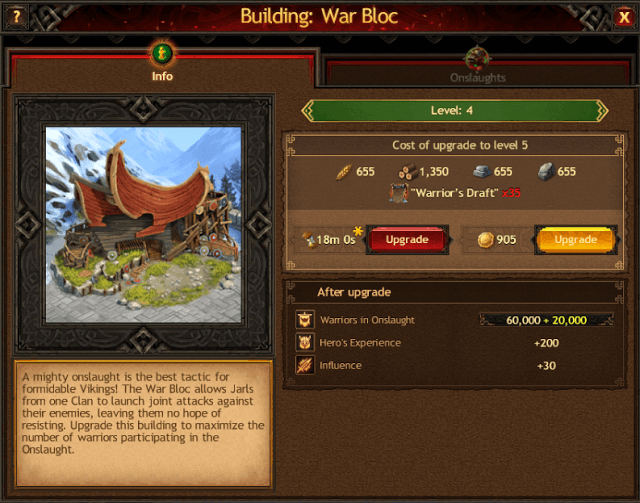 Upgrading the War Bloc allows you to form even more powerful troops for attacking enemy Towns. Every level increases the total number of troops you can send on an Onslaught. The Information tab contains all necessary information about the building, and the Onslaughts tab displays current Onslaughts formed by you or the members of your Clan. Use it to quickly navigate joint attacks. In the future, we will talk in detail about the Hero, who fights cunning Invaders for their Jarl, leads brave warriors in a battle and crushes enemy armies. It is essential to work constantly on these three buildings and level them up, as they are the ones that allow you to form a strategy for the Hero’s development and make them even stronger and more powerful. Play Vikings: War of Clans NOW!